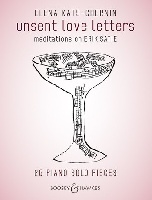 Descriptif : After the success of the piano album Piano Village, Elena Kats-Chernin now presents a new book: unsent love letters is a tribute to the eccentric genius Erik Satie. In his Paris apartment, dozens of unsent love letters were found after his death. Elena Kats-Chernin now sends these letters - in 26 meditative and passionate piano miniatures.